If you’re in need of an amber beacon, make sure you’re up to date on the rules for their use. We stock a range of amber beacons at Euro Car Parts, take a look at the options below. Amber beacons function as a warning sign. When used on vehicles, their normal use is to draw attention to a vehicle that’s moving unusually slowly, when there’s been an accident or to indicate that work is being done. There are certain rules around the use of amber beacons on vehicles, so it’s important to make sure you’re clear on what you can and can’t use them for. At Euro Car Parts, we only stock items from the best brands available. 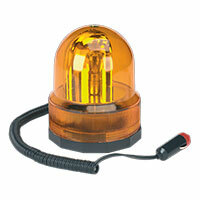 Above, you’ll find a great range of amber beacons, at affordable prices too. We offer free UK delivery and a free click and collect service on our products, so you can choose to have your item sent directly to you, or to collect it from one of our 200 branches nationwide. Browse the range today, and don’t hesitate to get in touch with a member of our team if you have any questions.